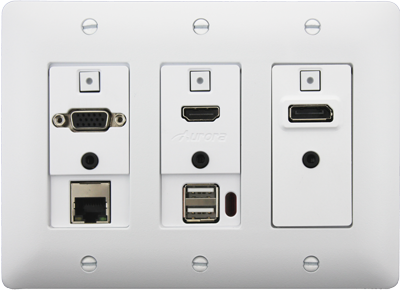 IPBaseT - AV distribution | Aurora Multimedia Corp.
IPBaseT and more - Come see us at ISE! IPBaseT and more – Come see us at ISE! IPBaseT – The evolution of AV distribution and routing! IPBaseT utilizes a 4K2K zero compression zero latency IP technology as a foundation for AV signal distribution, routing, control and video wall processing. Combining the strengths of various IP and AV standards (MPEG2, H.264, H.265, JPEG2000, IP USB, HTTP, Dante® etc. ), IPBaseT provides the ultimate distribution and routing solution. InfoComm 2014 Best Of Show Winner! 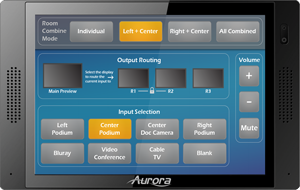 Aurora’s One Room – One Cable™ kits ship complete with 2-ceiling tile speakers, dual-input HDBaseT Wall Plate switcher, HDBaseT Receiver with 2x35W amplifier and a pre-programmed 8-button in-wall control panel. The three kits ORC-1, ORC-2 and ORC-3 make specifying, ordering, deploying and installing easy, organized and streamlined. Each kit is based around Aurora’s award winning DXW-2 Series keypads.